University of Houston College of Nursing students showing school pride on the job. 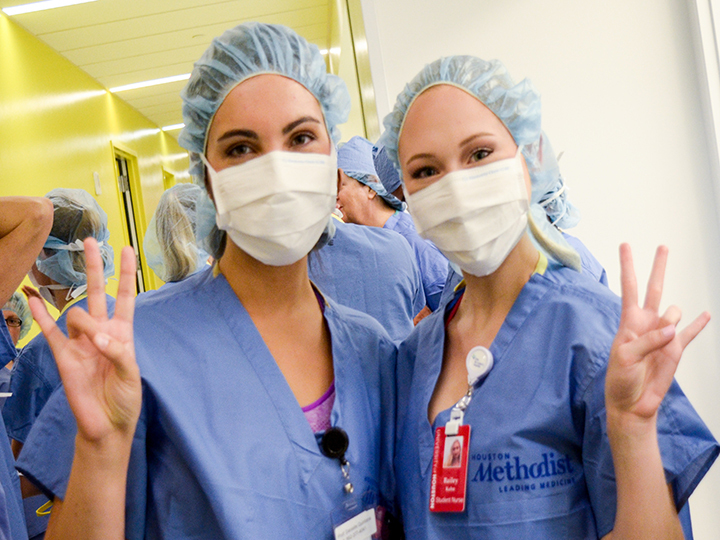 The top-ranked nursing program in Texas is University of Houston College of Nursing, according to RegisteredNursing.org, a nursing advocacy organization dedicated to promoting excellence in nursing. The organization made its selection based on the programs that supports students towards licensure and beyond. They ranked the top 50 nursing programs in Texas by analyzing current and historical pass rates of the Registered Nurse National Council Licensure Examination. UH College of Nursing boasts a 100 percent pass rate for the last three years, placing the program in the top 5 percent in the nation. The scores were very close to perfect for two years prior to that. “As one of the newer baccalaureate programs in the state of Texas, we’ve had a remarkable five years of growth and excellence,” said Kathryn Tart, professor and founding dean of the college. RegisteredNursing.org reviewed programs that offer an associate’s degree in nursing (ADN/ASN), Bachelor of Science in nursing (BSN) and direct-entry Masters of Science in nursing degree.